RESPONSE PERSONNEL CHRISTMAS RAFFLE IN AID OF KEECH HOSPICE CARE! 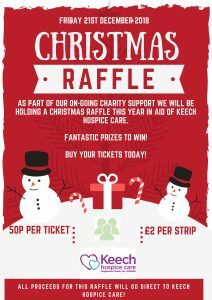 We are holding a Christmas Raffle in Aid of Keech Hospice Care, all proceeds will be donated to Keech and we will be doing the reveal on 21st December. Beauty by Marina luxary manicure and pedicure voucher. Also from Beauty By Kelly Bedford, Beauty By Marina and Lauren Mercier Make-Up! 50p per ticket or £2.00 per strip.